​YZ (Yuko Zama): I heard from Greg and Erik that they asked you to write this piece 'Without' for their duo. Can you tell me what came up in your mind when you were thinking about writing a piece for a duo of violin and percussion, or particularly for this duo of Greg and Erik? CA (Clara de Asís): I wrote this piece particularly for Greg and Erik. Even if I knew and highly appreciated each of their respective works and collaborations, I had never listened to their work as a duo before. My first exposure to their duo was their recording of Eva-Maria Houben’s ‘Duos’, a wonderful album that they had recorded recently, which they introduced to me during our first exchange. What struck me from their realization was that I found a great symbiosis between the two, but both kept the uniqueness that distinguishes their voices. As if it was precisely because of, or through that individual uniqueness that they reached each other and achieved a form of unity. I could feel this very clearly. I can say this was one of the main (or part of) thoughts that I had in mind when I started working on the piece. So I contemplated two “parallel” existences that would have an organic relation. Like looking at no matter what vision, what landscape, what direction. We can see elements that exist individually, but still in permanent relation with each other, bringing up something else, something arising from that. CA: I don’t think I get conscious inspiration from things that I’d apply directly, but it’s ratherthat the things that inspire me, act on me in a surreptitious way, on the inside, and I guess that some of them end impregnating, indirectly or without my conscious knowledge, what I do. Because if they act on me, they necessarily act on what I do. During the period when I was working on the piece, I was very marked by the book of Simone Weil’s La personne et le sacré. It’s a very lucid reflection on the concept of ‘person’, and how the ‘sacred’ lies beneath impersonality – and far from collectivity. I was also very impressed by her thoughts on love and on attention as the purest form of generosity. Maybe this has influenced the piece somehow – I can imagine it has, but I don’t really know. YZ: Can you tell me about the title "Without", like any thought or concept behind the title? CA: I came to the word ‘Without’ after some time, in the last place, once that the piece was composed. It came as a verbalization of some thoughts that I had been having, but thatweren’t shaped with words. At first, ‘Without’ just felt right. Then I realized how much it is related to what I said for the first question. It’s not about lack or absence - there is ‘with’ in ‘without’ -. It’s a word that expresses – or even that shows – that every combination is made out of autonomous elements, that must be able to live, to exist, to form a whole together. For the with to be possible, there must be a without. It expresses the ambivalence of the elements in a whole. Because for a whole to exist, the elements are together, are with each other, but in order to be so, every element must also exist without the rest; exist, let’s say, individually. In order to form a whole, you have to be simultaneously with and without the rest of the elements. Also, that word, ‘Without’, I was feeling in the piece some kind of affinity with it. Because of the simplicity of the piece. Simplicity versus addition. ‘Without’ evokes lightness to me. ​​YZ: My impression of the piece was that it contains some sort of a minimal silent beauty which resonates with an aesthetic of a Zen garden while containing the Western aesthetics in the colors and the textures of the sounds (as well as the vibrant energy underneath), in the meditative stillness. It is a simple but well-thought composition with the perspective of the 'openness' and the 'depth'. The intensity of the sparse sounds and silences is remarkable, and most of all, it feels so organic like watching a landscape in nature. Did you have any particular image (or anything) in your mind when you conceive and compose this piece? CA: I really like your impression of the piece and it touches me deeply, because I feel a great affinity with the image that you evoked. The image of a landscape was indeed present to me when I was conceiving the piece – landscape as a whole of elements that existsindividually, but still in permanent relation with each other, unwittingly, bringing up something else, something arising from that. YZ: When I listened to the mix of Without for the first time, I was particularly interested in how the ‘silence’ in your piece felt different from other composers’ works I was familiar with. Silence could obtain various different natures depending on how it was incorporated into a composition or a performance – it could feel like a sound, it could obtain a weight, or it could feel as if it was changing the way time passes by, or it could feel awkward if not applied in the right context. To me, your ‘silence’ felt very organic and unpretentious, containing serene stillness with no extra heaviness or indication. It has a quiet intensity and consistency with lucidconsciousness, but has a natural openness with no pressure. To experience this silence through your piece was somewhat very refreshing to me, like entering a new dimension that I had not known before yet somewhat felt so familiar. How do you define ‘silence’ in your piece, or in other words, what do you see, hear, and experience in ‘silence’ as an element in a composition? CA: I experience silence as a part of the sound itself. Every sound contains silence. I consider the sounds beyond their highest peak of evidentiality. They are more than just an audible phenomenon. When a sound stops sounding, it hasn’t finished yet; it’s still there. It’s like the rain: rain is not only water falling from the sky. We still have the feeling of rain once it has stopped falling: there’s the humidity, the puddles on the floor, the reflection of lights, the fresh smells. Rain is still experienced even after it has stopped falling. Rain is not only water falling from the sky, it is also the fallen water. So is sound to me: sound is not only what comes through our ears, it is also what has come previously. Reducing the sounds only to their audible dimension would be like reducing a plant only to its visible result. But there are many other subtle forms of their existence. We can still perceive things once their highest degree of intensity has decayed. In the case of the senses other than the ear, this is commonly accepted. For instance: after tasting a fruit, we still have the taste of it in our mouth; after staring at a candle, we close our eyes and we see the light; after touching a hot surface, our skin feels hot. – Why would the ear be different? So I try to adopt a listening attitude that is receptive to the wholeness of what I consider a sound to be, including their silence. YZ: How did you feel about the way Greg and Erik responded to your composition "Without" and realized it? CA: Something that I had found individually in both Greg and Erik and that impressed me was (and is) the extreme attention of their listening, and besides a great sensitivity, intelligence and humbleness, and a very precise and subtle technique, how the act of listening is central on their practice. I just love their realization of the piece. I feel very grateful for their work. I had composed the piece for them to make it exist and they made it exist. Before listening to their realization, I had a sound image idea in my head, but I didn’t have an exclusive expectation about how everything “should” sound. Even if it has a very precise structure, the piece is also open in many aspects, and that openness was for them to go through it. When I listened to their realization for the first time, I was very impressed by how the feeling that I was perceiving of it, matched exactly with the feeling that I had of it when composing it. It’s a wonderful realization. YZ: In 'Without', it is interesting since the two performers seemed to switch sides at some point in the piece. Erik was heard on the left and Greg on the right at first, but then they were on the opposite sides in the end. Erik explained me that they did not switch their positions during the recording session, and it was done digitally during the mixing stage as you requested, so the positions of the two players can be perceived to be slowly switching over the course of the whole piece. I think these diagrams are quite fascinating. Can you explain what you aimed by switching the positions of the two performers along with these diagrams? CA: The thoughts about the space and the motion in the piece came once the score was finished, and Erik and Greg let me know that they were going to record it. To me, the mixing stage and the recording set up are both directly related to the image of the space in the piece (whereas the writing stage has to do more with time). In this particular piece, concerning the space, what felt the most organic and natural to me, was this circularity. I didn't want Erik and Greg's voices to be in a specific point of the stereo field and not move from there, this would have reduced them to a "call-response" effect that just wasn't coherent with the piece, that wasn't the point at all. And if their positions had switched more or less randomly, a natural flow would had been lost. I think that the same feel that I had while composing the piece aimed my decision to switch their positions very slowly. It's, again about two existences in parallel that develop very organically; at a point they converge, then each continues their own way. This parallelism creates a form of unity, and at the same time, both voices are individual. Also, the fact that the voice starting at R ends up at L, and the one at L ends up at R, introduces a form of cycle. The first diagram represents this motion: the line from L to R and vice-versa draws visually a diagonal (and, consequently, an X), but perceptibly, I feel it more as an open circle. Each voice draws a half circle, and, in the end, the combination of both forms a whole circle (a cycle). Why choose to switch positions during the mixing stage and not directly during the recording, there were many reasons. You can be a lot more meticulous about the exact position of each voice in the stereo field. Besides that, I was interested in the motion, but I didn't want the motion to imply a result of the sound distancing away from the listener. 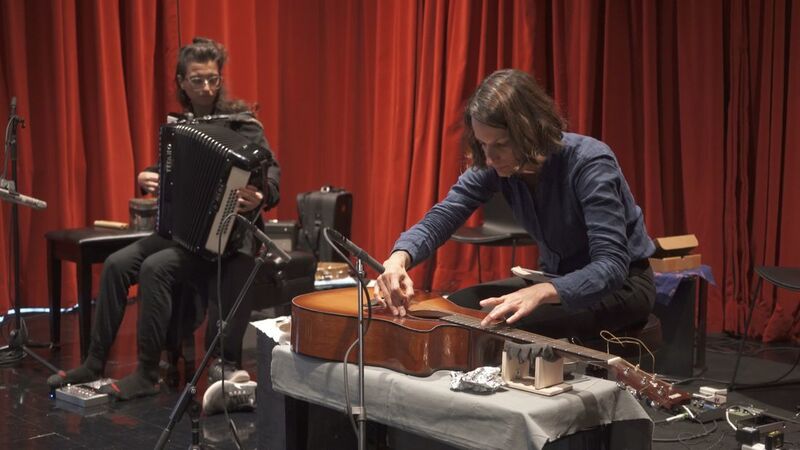 Getting the motion but not the effect of distancing away from the mic would have been technically more complicated to do during the recording; and the studio where it was recorded would have been attached to the acoustic representation of the space in the piece. Yet I wanted it to be an abstract space, not a print of a particular location. And if they had done it during the recording, I think that it would have implied a presence in the piece, their physical presence, their bodies moving, even subtlety. While I think that it can be definitely interesting and it's something I’d like to work on maybe at some point, that wasn't the aim of this specific piece. – The second diagram is a suggestion of the position of the mics. YZ: I saw your live performance in a duo with Lucie Vítková at Keith Rowe's event in NYC this October. I thought it was great. During the performance, you created an intense atmosphere while keeping a wonderful openness, never losing the consistency of the entire flow of the music in spite that your performance contained a large amount of silence. I often feel that many musicians tend to rely on 'spontaneity' a little bit too much in a hasty way during a live performance (especially in improvisation), trying to fill the space with sounds as minute and various as possible, which often feels as if it narrows down the potential of the music with subjectivity and weakens the structure (to me). But your performance was anchored in the core of the piece with stability, letting the music flow in an open space by believing what would occur in the course of the set with a great confidence. I was impressed with how you kept the calmness throughout the piece, listening to the sounds and the silences keenly, patiently waiting for the simple minimal sounds to grow in the silence as the music develops, and seeing how simple elements of sounds and silences could accumulate to form a music over the time. Silences felt so organic and seamless as a part of music in your duo performance. I think it was very courageous to keep such an open space with so minimal elements yet never lose its intensity. I found a similar serenity in Erik and Greg’s duo recording in your 'Without', too. I think this naturalness and openness are significant natures that make your music so distinctive. CA: Thank you very much for your words about my performance at Keith's event. I appreciate that a lot. I must say that I feel a big affinity with your way of listening, because the things that you highlighted are precisely what I value the most. I feel exactly the same way about spontaneity in live concerts, especially in improvised music. It can lead to a display of self expression and make the music to be, in the end, something about the person who is playing, and not about the sounds. Maybe one of the reasons why that happens is that, when performing, the perception of time is other than the "regular" one, and the risk of impatience is bigger. A response to that impatience is, very often, to fill the silence and vary as much as possible. I also think that, in general, we all, artists or not, are constantly incited to "express" ourselves in the society we live in. And this can prevent us from actually listening to what exists around us. I didn't know how our duo performance at Keith’s event would go, since there were some factors that introduced a certain unclarity to me, especially the fact of not having been able to travel with my guitar, and also being in a situation of improvisation, which I barely practice anymore. But it was great to perform with Lucie, and we had had the opportunity to exchange and work on the performance beforehand. Even in situations that include an amount of uncertainity (and I guess this is also good), my approach to sounds and music remains the same - maybe it's much about trusting the sounds. I'm really happy that it touched your sensibility.